Stand up paddle boarding is a fast growing sport and when you try it, it is easy to see why. Not only is it a great workout, but it is loads fun and easy to learn. 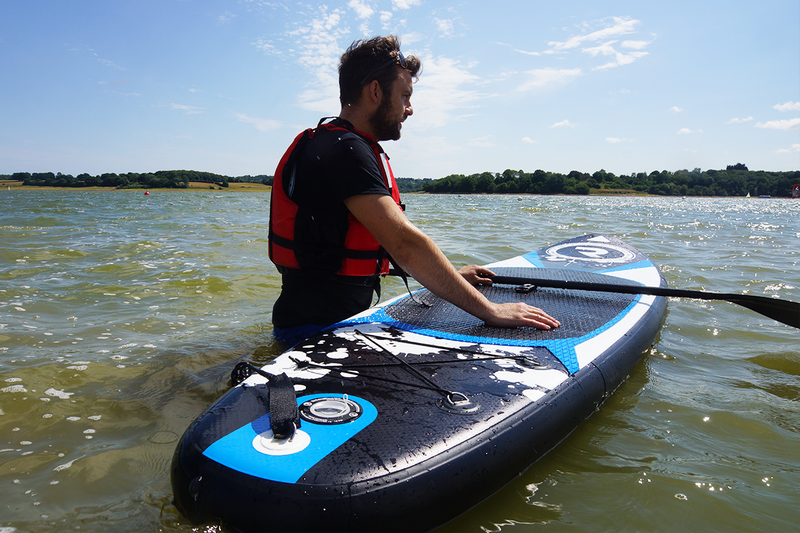 However, there are some things to know before purchasing your inflatable SUP, so you are fully prepared for your SUP adventure. Although it says inflatable, it does not mean lightweight which can be a pain when you have to carry them over the beach when the tide is out. Boards come in a number of different sizes, so you can choose one that is more suitable to your size when it comes to carrying it, or, go paddleboarding with a friend so you can help carry each other’s boards and paddling accessories. Of course, the weight of the vessel is an issue for any water sport, such as kayaking. The upsides of having an iSUP as opposed to a solid one are that they are easy to transport and easy to store, as they can be rolled up like a sleeping bag and fit into the boot of your car. Solid boards, like surfboards, require a roof rack or larger vehicle. But the downside of getting it easily to your paddleboard location of choice is that it takes an added 20 minutes or so to pump it up. The easy solution is to get an electronic pump, but that still takes time. First time paddleboarders, no matter what great shape they are in, are going to be faced with aching muscles the next day. Remember to stretch before and after your paddle session as you can expect a full cardio and balance workout, even though it may appear you aren’t doing much. However, SUP is low impact and doesn’t put much stress on joints, so after a few sessions, your muscles will get used to the movements required. Whether you are paddling on calm waters on a lake or tame waves at sea, you will almost certainly fall in on your first time paddling, especially when you go to stand up, as finding your balance can be hard. Of course, practice makes perfect, but expect to get wet the first few times on the water! Hopefully, the water isn’t too cold, and you get back on quickly to try again, and again! Try to save yourself the expense of buying new glasses or sunglasses and leave them in your car the first few times paddleboarding, as it is likely they will fall in. If you need glasses for eyesight, get yourself a glasses strap – there are even floatable ones available, perfect for water sports. Pack into your dry bag a bottle of water. Paddleboarding is thirsty work, and if you are paddling on the sea, you need something to wash away any accidental intakes of salty sea water. During winter, you can even add a flask of something hot too. Even if the weather is bright, sunny and the water as warm as it ever can be in Britain, a hot drink at the end is needed. Pop to the beach café or bring a hot drink in a flask with you so that you can treat yourself at the end of the session. Hopefully, these points will not put you off paddleboarding at all, but help you better prepare for your first session when you buy a quality SUP board for sale from us! Because, when you do get out on the water, you will quickly find paddleboarding is a lot of fun and being on the water is such a wonderful experience. If you want any more tips and guides to SUP, kayaking or canoeing, take a look at some of our other blog posts!